This year has been an interesting one for my photography. As I said in my earlier post, I had some photos and a ceramics piece in a show at the Phelps Arts Center. My photo of the Sunset on the Erie Canal in Fairport got some more attention while it was there. A graphic designer, Chris, talked to me about possibly using it for the Perinton Bicentennial event poster & wine label. After talking with him for a bit, we decided that I’d email him a low-res copy of my picture so he could mess with some ideas to present to the board.A week or so later, I received an email from Chris saying that they loved it and requested that I write-up an invoice for the town and Casa Larga, so they could use the photo. Chris put me in contact with a representative from Casa Larga, because they would want some background information for a press-release. It turns out they wanted more than that, they asked me to show up at their tent at Fairport Canal Days for wine-bottle signings, and they also want me to go to the wine shop for an event later this month. I had a wedding that I was attending the weekend of Canal Days, and the only day I was able to make it out there was Sunday. It rained most of the day, which sucked… but there were still a lot of people at Canal Days. I didn’t expect that many people to be out. Dad took a picture of me at the Casa Larga tent one of the brief times it wasn’t raining. I ended up signing a dozen or so bottles, and got quite a few compliments while I was there. After that show ended in Phelps – the pieces I had there, along with a new photo, went over to school for the Spring Arts Festival. The stuff in the show this year was fantastic, better than last year’s show I think. My photos got a bit of attention once again. The Canal photo that is getting most of the attention won second place for photography, and one of the other photos [bottom right in the picture] I entered was given an honorable mention, and the faculty at school purchased it for display around the campuses. My Xbox 360 died earlier this year; after 5 years it finally got the Red Ring of Death. That happened right around the release of Mass Effect 3… which I planned on playing on my 360. Instead of continuing my game, I was forced to start a new game on the computer [since I didn’t replace my 360]. I still haven’t made it all the way through the game. School was more important at the time, and I haven’t bothered getting back into it. I’m still looking into replacing my 360, but I’m not sure how I want to go about it. I could buy a cheap refurbished one, or I could take the plunge and buy one of the 360 Slims. I don’t know which I would rather do… that and I’d have to save up for the Slim. Getting a refurbished 360 would be much cheaper, but it runs the risk of getting another RROD. Whereas, if I picked up a Slim it would be more expensive, but I shouldn’t have to worry about the system dying for a while, and I would have more hard drive space. I would also have to buy the transfer cable to copy the stuff from the HD in my old 360 to the Slim. Also, it’s getting to the point that new systems should be released soon. I think I’ll probably just end up with a refurbished one. Diablo 3 came out in May. This is one game I’ve waited a long time for. I only played through the original Diablo a few times, but I can’t tell you how many times I played through Diablo 2, or how much time I spent farming bosses and the Secret Cow Level with friends. I’ve heard mixed reviews about D3, personally I love it. 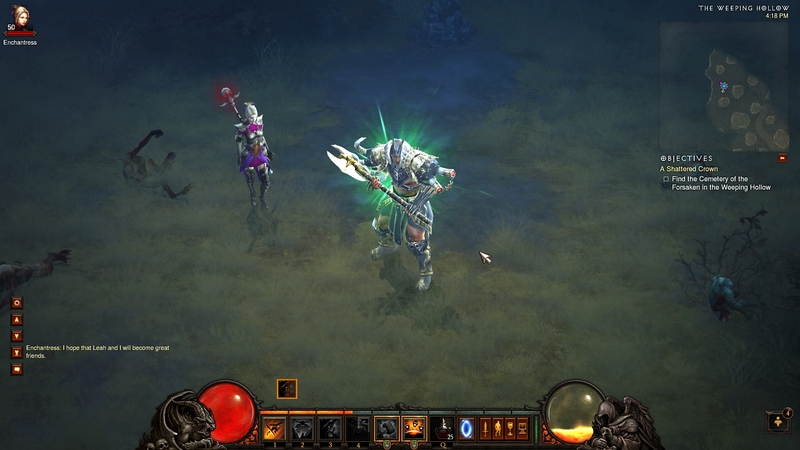 It still has that old Diablo/Diablo 2 feel, but there are new features that give it a slight touch of MMO. The skill bar is the biggest one that I can think of; instead of having just the mouse clicks for attacks there is now the 1-5 buttons that you can assign skills to. There are five to choose from; the Barbarian [melee, physical], Demon Hunter [ranged, physical], Monk [melee, physical/magic], Witch Doctor [ranged, physical/magic], and Wizard [ranged, magic]. Unlike Diablo 2’s max level of 99, the level cap in Diablo 3 has been limited to 60, who knows if Blizzard plans on raising that in the future [with or without an expansion]. The stash starts out small [7 blocks x 2 blocks], but is expandable [up to 7 blocks x 10 blocks] by purchase with gold. Then there are also 2 extra tabs that can be purchased with the same amount of space. The stash is also bound to your account, not the characters, there is no more needing friends to hold a game open to transfer items between characters. I’m not sure which is my favorite, but the two I’ve played the most is my Demon Hunter followed by a pretty even balance between the Barbarian, Monk, and Witch Doctor. I think I’ve only invested about 5 minutes into the Wizard so far, but I’ll play that more eventually. Blizzard added a new mode. In Diablo and Diablo 2 there was Normal, Nightmare, and Hell… now there is also Inferno. My Demon Hunter is the only character that I have made it to Inferno with so far. All I have to say about Inferno is that the elite mobs make all of Hell mode look like a cake walk. Some of them are comparable to [mini] raid bosses in MMOs. Blizzard also replaced the Secret Cow Level that was in Diablo 2. 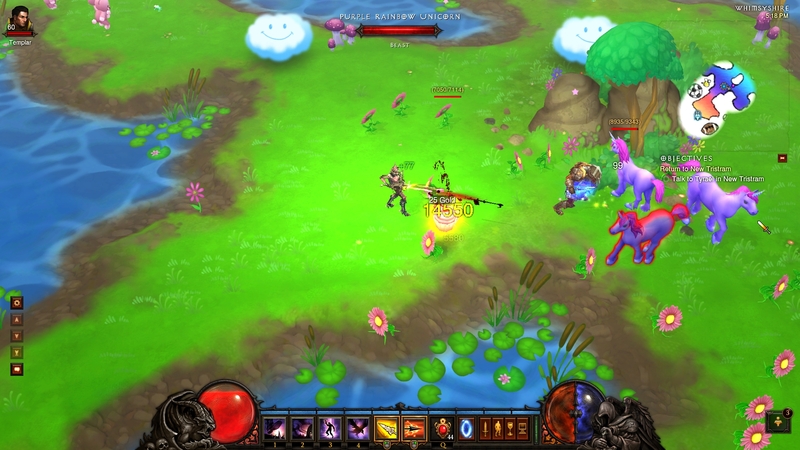 In Diablo 3, the secret level is Whimsyshire… the land of flowers, rainbows, teddy bears, and unicorns; all of which are out to kill you… well, except the rainbows – they’re just pretty. The map is amazing, it looks like a little kid drew it. Once again, all the maps in game are randomly generated, so things aren’t going to be in the same place every time. I stepped away from Diablo 3 this past weekend because I participated in the Guild Wars 2 Beta. I played the first game a bit, but at the time I started playing the first Guild Wars, I was already playing [and enjoyed] World of Warcraft more and I just stopped playing Guild Wars. From what I got to play in the beta, there are a lot of new concepts… but there’s only so far you can go with a MMO. I would have played more, but I wasn’t home all weekend, and the beta did not like running properly on my laptop… so I left it to when I was at home and could use my desktop. The story is interesting, the way it plays out is you are the hero, and every NPC knows it, when you create a character you give it background which changes how some NPCs interact with you [what god you worship, if you were noble or a street rat, etc]. Some of the chat sequences are a little like cut-scenes, it says they’re still a work in progress. It’s interesting and gives the game a bit of a single-player feel. Combat is cool, there’s the typical combat but there is also an interesting concept called “downed-state” [if you lose all your health]. Instead of dying right away, you go into a downed-state. In a downed-state you can fight using 4 skills [different from the typical class skills] that will do damage and help fill the bar, there is a chance you can survive if you manage to fill up the downed-state bar, otherwise [if it’s depleted] you die and have to respawn at a checkpoint. Other players can also come to you and help revive you while you are in the downed state. There is no tagging mobs for exp/loot. If someone is attacking a mob and you stop and help, you will get a little exp and possibly some loot. I don’t know if it cuts into their loot/exp table from the mob or not, but it’s nice to get a bonus for helping random people. The attack buttons are pre-defined to the numbers above the alphabet on the keyboard, and I can’t find a way to change them [one thing I did in WoW was reassign some skill buttons to other keys that were easier to get to]. The first 5 skills [1-5] are based on what weapon you are using, and every weapon has a different set of skills. When you get a new weapon, you only have the first attack available. As you use a weapon more, you become more experienced with it and unlock the second skill, then the third, etc. Skill 6 is your self-heal skill, every class has one, there are no healers/dps/tanks. You have to keep yourself alive [use your skills, heal, and double tap directions to dodge]. Skill 7-0 are based on your class and what skills you chose with skill points. I didn’t get into crafting this time [just disassembling gear for materials], maybe if there is another beta I’ll get a chance to mess with that more. You can disassemble weapons, armor, and some other things to generate the crafting materials, which is neat. You can also collect materials throughout the world [mining, herb gathering, and something else I can’t remember]. The bank is account wide, so if you put an item in on one character and hop to another, you can withdraw it from the bank on that character. The bank also has a separate tab that stores specifically crafting materials, so they don’t take up bank/bag space. I really like that, cause every time I upgraded gear, I disassembled the old gear for mats and my bag/bank would fill up very quickly. The world is massive, and as far as I can tell, there are no mounts to ride. There are waypoints you can discover and instant-travel to for money, but if you’re always doing that you will miss out on experience and world events that happen all the time in random places. The art is pretty cool, landscapes and creatures are cool looking, yet another reason to run and explore. There is also exploration [jumping] puzzles that will reward you if you find/reach the end [I got an extra skill point from one, and a better weapon from another]. I haven’t had any official groups/parties, just a few with NPCs in the starting areas and the world event auto-group thing. The auto-group thing doesn’t actually form a group/party, but if a few people are doing tasks for an event [ie – protect a farm from bandit invasion (kill bandits & ruin their morale)] and one person completes part, everyone working on that event gets credit. Overall, Guild Wars 2 something I’m going to keep my eye on and play any beta I get into. I haven’t done much in the way of gaming the past few weeks with everything going on before school starts. I still haven’t started Assassin’s Creed 2, the little time I’ve spent gaming has been Modern Warfare 2. Finished up Spec Ops on Veteran with my brother, every single mission. Sadly, I think the last two missions were easier than a few of the others. I hope there’s a bit more time after school starts! Random thought… I wonder how long it will last. I’m gonna start tagging each post with the musical artist[s] that play when I post. Hope everyone is having a good & happy holiday season! Just a minor update for me today… thanks to Christmas, I’ve added a new game to my collection – Assassin’s Creed 2 [didn’t fully expect that one from my dad, heh]. Now I have to finish up the first AC so I can start AC2! I decided to take a step back to a few games I still need to finish playing through today… Assassin’s Creed & Batman: Arkham Asylum. Apparently in Assassin’s Creed, I only had three more people to assassinate, now I’m down to one. I can only deal with the repetitive quests so many times before I get annoyed. I do enjoy the freedom to do the quests in whatever order I feel like. I’m not a huge fan of each city being sectioned off and being locked out until very late in the game… it’s not like an RPG where mobs in restricted areas are a higher levels, it’s the same guys you see everywhere else. I wasn’t nearly as far in Batman as I thought I was, when I started today, I had only made it about 45% of the way through the main story. Apparently I spent a lot more time exploring & looking for all the hidden things than I had originally believed. The combat system in Batman, is pretty damn good… I’d say near flawless. There are times that you can issue a command [for example: counter] and Batman will either stop mid-movement and [sort of] transport to the enemy that was attacking, even if they’re a few feet behind him… or he’ll stand there like a statue and get hit. Now, the lack of response might just be today because of the low battery in my 360 controller. There are minor problems within the game that I’ve noticed, but nothing that reduces the enjoyment of gameplay. I think other super-hero games [Spider-Man, Superman, etc.] need to take a lesson from Batman: Arkham Asylum. I’m a gamer, no denying. The past month or two my computer has been out of commission. Rather than fixing my PC right away, I decided I needed to take a small step a way from games (mainly World of Warcraft) and get out with my friends more. It’s difficult since I work in the morning/early-afternoon and most of them work in the mid-afternoon/evening, but it’s a lot easier since I stopped working overnights. Even with staying up “late” to hang with friends, I’ve been getting more sleep then when I was on overnights. I dusted off my 360 to play some games that I left untouched, since I have some free time when everyone else is working. It’s a lot easier to pull away from games that don’t require more time (WoW- raids, endless grinding to level, etc). Finally finished up Mass Effect [the last 2-3 hours I skipped out on *sigh*], I think it had great story & excellent game play. My only concerns are the load screens/time, and some bump-mapping issues. Quite often it takes a second or more for the textures to load during scene changes [conversation sequences, doors opening, amongst others], and right after load screens. The inventory system could have use a bit of work as well… it felt a bit jumbled at times. Despite all the load screens & bump-mapping issues, Mass Effect is worth it. I plan on picking up the sequels. I’m still not too impressed with Fable II. I don’t find the story line very interesting, there are many load screens, & if you get a lot of NPCs in one area the game bogs down and gets jumpy, there are also bump-mapping issues at times as well. What really kept me playing the game was the achievements that would add points to my gamer-score, and the fact that I could just go around murdering whole villages or saving the entire countryside on a whim. I’m not sure if I’m gonna pick up Fable 3, we’ll see though… I’m hoping for improvements. I’m a big Batman fan, so Batman : Arkham Asylum was a natural choice. It’s pretty good, I still need to play more of the story, I got distracted doing the challenges (specifically the Scarecrow one that was downloadable). The story, graphics, and game play are all excellent from what I’ve seen. There are Challenges given by the Riddler throughout the game that you can solve for extra achievements & game completion if you enjoy that kind of thing, I know I do. That’s probably a big reason I haven’t beaten the game yet, I spend a lot of time “treasure” hunting. I’ve beaten Halo 3: ODST, the story line was interesting with the way they hopped between each of the squad’s stories. I was slightly disappointed in the difficulty of the Legendary mode, it seemed a lot easier than Halo 3. Since you’re not playing as Master Chief, I would think it should be more difficult without the over-shield and not being genetically enhanced. Firefight is amazing. Although it has no random grouping functionality (like Halo 3 matchmaking). There have only been a few times I’ve actually had enough friends on at the same time to play and it be worth-while (and even then it’s only been 2… maybe 3 out of the [almost necessary] 4 possible). I would love to play it more, but in order to get far enough to make it worth while, my friends and I are going to have to make some sort of schedule for it. Borderlands… ah, Borderlands. Probably the best description I’ve heard about it is, “it’s like the Diablo games and the FPS had a baby.” I chose to start with Mordecai, the sniper. I’ve reached level 19 on him, it’s a lot of fun. Now my newest sniper rifle has enough power to completely blow enemies heads off, and lower level mobs can be blown to pieces with said rifle. One thing that gets me is the fact that some non-sniper weapons have a zoom scope almost as good as my sniper scope, I don’t think I need that good of a scope (or any) on a shotgun, but some I’ve seen do have absurd scopes on them. The inventory system is alright, only 12 slots to place things when you first start, but it’s expandable… right now I’m sitting at 18 slots. The lack of space can get annoying at times, since any extra guns, shields, or first aid kits all take up space. If you want to carry a first aid kit or two to be safe, be ready to give up precious inventory space. If you get hurt bad enough, you can chose to fight for your life or respawn back at the last save spot you walked by in what is essentially a clone body… this costs money though (currently $600-ish per spawn). I should probably start carrying a first aid kit, just in case I need it, but I would rather be able to carry that one extra gun that will add to my arsenal, or my wallet if I sell it. You also start with the ability to carry a main weapon and secondary weapon, as you progress you unlock the ability to hold up to 4 weapons, all choseable by cycling through them or hitting a hotkey. I still have a few other games to work on that didn’t impress me too much for one reason or another: Blue Dragon (RPG, might just need to get further into the story), Assassin’s Creed (while pretty, it is very repetitive), & Grand Theft Auto IV (I’ve always taken my time with the GTAs, so this one will take a while) just to name a few. Obviously I’ve since fixed my computer. And yes, I’ve started playing World of Warcraft again, but nowhere near as much. I still enjoy the game, but I know I need a break from playing it as much as I used to, so I’ve been limiting myself. When I do play, I’m hopping between my Death Knight [Deathengine] on a server with my brothers and my Mage [Stasís] on a server with some friends. 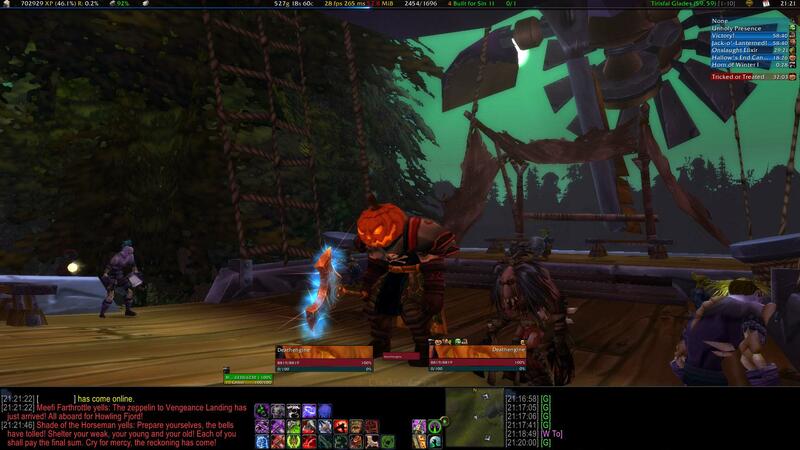 I hit 70 on my DK today, and did a few of the Headless Horseman quests for the Hallow’s End event. I’m debating if I want to power level to 75 so I can complete the quest to kill Headless Horseman, the event ends next Saturday.